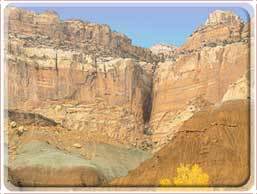 Capitol Reef National Park was established to protect a 100-mile long wrinkle in the earth's crust. It is known as The Waterpocket Fold. 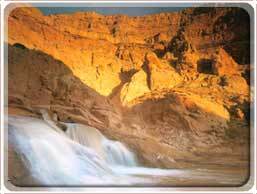 This fold runs from Thousand Lakes Mountain to the Colorado River (now Lake Powell). 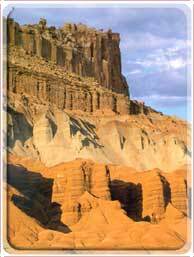 Not only does Capitol Reef contain this amazing geologic features, but it also contains unique historical and cultural history. The park is open year round along with the three campgrounds. The Visitor Center is open year round also, except for Christmas Day. It's open 8am-4:30pm with extended hours during the summer. The Visitor Center is located 10 miles east of the town of Torrey, Utah or 37 miles west of the town of Hanksville, Utah on Utah Highway 24. The drive into the park is spectacular, especially if you're coming from the west. Tempertures during the summer can climb to the upper 90s, but nights cool down to the 50s and 60s. July through September is thunderstorm season and brings cloudbursts, flash floods and lightning. Spring and fall are milder with highs generally in the 50s and 60s. Winter highs average less than 50 with ligh snowfall. Utah Highway 24 runs east and west through the park and there is a 25 mile loop that travels through the park and starts at the Visitor Center. There are also many dirt roads that traverse the park but check with the Visitor Center first to get the road conditions for these roads. Capitol Reef National Park has three campgrounds: Cathedral Valley Campground, Cedar Mesa Campground and Fruita Campground. All three are open year round. Cathedral Valley and Cedar Mesa offer free primitive camping while Fruita is developed and has picnic tables, restrooms and water. There is a $10 for Fruita. May through September, the park offers a variety of ranger-guided programs at no charge. These include guided walks, talks, and evening programs at the campground amphitheater.